Steve Fugate has made it back to Florida! 260 miles to go to Vero Beach! I’ll stay on US Hwy 301 to Folkston, GA where I will take US Hwy 1 into Florida and all the way home to Vero Beach. US-1 SOUTH to US-601 SOUTH to US-301 SOUTH to US-1 SOUTH. At Camden, SC I will get on US 601 S. At Bamberg, SC I will get on US-301 S. and take it to Homeland, GA where I will get on US-1 S. which I will stay on until I get home to beautiful Vero Beach, Florida! I will be within 50 miles or pass thru theses South Carolina cities: Florence, Hartsville, Camden, Columbia, Lexington, Sumter, Orangeburg, Barnwell, and Walterboro. New Route update for Steve Fugate….On alt US 220 south just past Bisco, NC. Will take to US 1 south to US 52 south into SC.
. In North Carolina, I will take NC 119 South to NC 62 South to NC 49 South to U.S. 220 to South to NC 134 South to NC 24 to NC 109 South to NC 742 into South Carolina. I will be within 50 miles or less to the North Carolina cities of, Winston-Salem, Greensboro, Burlington, Hillsborough, High Point, Chapel Hill, Raleigh, Asheboro, Salisbury Kannapolis Concord, Charlotte, and Fayetteville. 4/30/2015. I’m leaving Burkeville, Virginia this morning on U.S. Route 360 West to U.S. 58 West. Just before Danville, VA, I will take VA 119 South into North Carolina, which is about 80 miles away. In North Carolina, I will take NC 119 South to NC 62 South to NC 49 South to U.S. 220 to South to NC 134 South to NC 24 to NC 109 South to NC 742 into South Carolina. I will be within 50 miles or less to the North Carolina cities of, Winston-Salem, Greensboro, Burlington, Hillsborough, High Point, Chapel Hill, Raleigh, Asheboro, Salisbury Kannapolis Concord, Charlotte, and Fayetteville. I will continue on 522 to VA 609 to US 360 West to US 58 West to VA-119 witch I’ll take into NC. Just outside Warrenton, VA on US Rte 15 south headed for Culpepper where I’ll get on US Rte 522 south. I’ll stay on that for nearly 60 miles and then take several state routes to US 360. Steve just made it to Maryland..
As I am not permitted to walk on interstate highways. My routes thru DE and MD are too numerous to list. To get my exact route: Go to Google Maps, put in Brandywine, DE to Harpers Ferry, WV. Then choose ‘car’ as transportation mode. Check ‘no highways’ and ‘no tolls’ as route choices. That is my route thru Delaware and then Maryland. For the rest of my route, simply add Vero Beach, Florida. 4/14/14. Lucked out last night and made it into Crescent, Oregon and a motel room just before dark. Didn’t think I would make the 19 miles from Chemult, as I never left until 11:30. I flat out boogied, for an old man. I’m getting ready to walk across the street to get breakfast and COFFEE! Then I will continue on toward Bend 45 miles north. And, I’m happy! 4/13/14. I will leave my room in Chemult, Oregon this morning and continue toward Bend on U.S. 97 north. 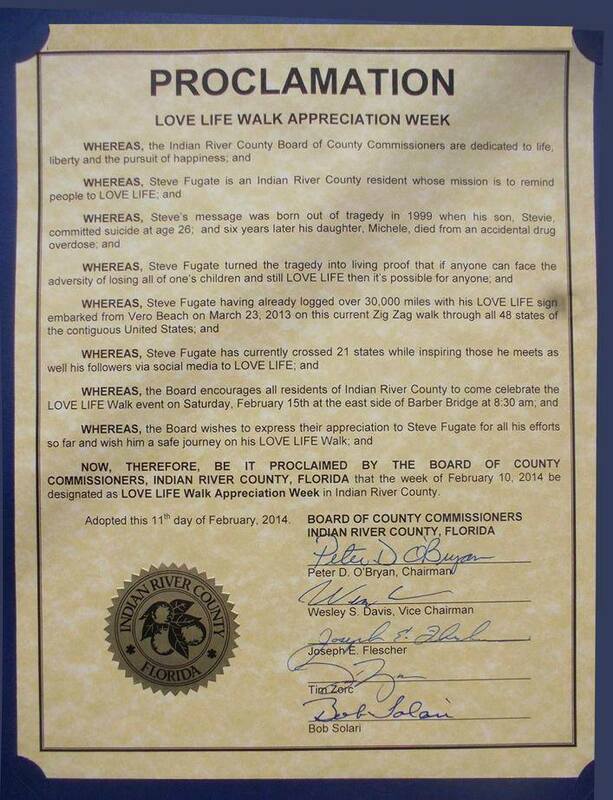 Love Life Walk Appreciation Week Proclamation by Indian River County Commissioners! Indian River County Love Life Walk Appreciation Week Proclamation by Indian River County Commissioners! Invitation to Walk a Mile in Steve’s boots event. It was such a pleasure meeting you! Here I thought I was going to do something nice by offering a stranger a lift only to receive the gift of inspiration instead. Thank you and stay safe! Today i met Steve,in Mendota Calif.,and i walked away knowing that life is precious….Thanks Steve. 🙂 God Bless you. Thank You for everything that you do! The life we live is precious, and there is no telling how many lives we can touch through our actions and deeds. I have been going through some tough times and haven’t smiled lately. Saw an article about you and came to your webpage and it put a smile on my face. Thanks!